Sometimes, whether it’s watching the coverage of the tsunami in Japan or just sitting and enjoying my family, I’m overcome with the feeling of being small. I don’t mean literally but in terms of the universe. Have you ever almost driven yourself crazy thinking about how someday you will not exist? That thousands of years from now we’ll be a blip on the radar of the Earth? I make myself feel sick and hurt my brain if I continue in this vein. Of thinking that someday the planet might be used up and the human race might not exist…or at the very least, my family and I won’t. That’s hard to digest. I’m not sure what I believe, but I’d really like it if there is an afterlife. Do you ever think that maybe THIS is the afterlife for some of us? And Hell for others? Some people suffer so much and some people don’t. If this is my afterlife, I’m pleased. I’m loved immensely. I love others completely. I am the mother of three beautiful souls. I am the wife of the greatest man I’ve ever known. I have everything I need. If this is it, I’m good. I may have to read that “Mr. Clean”….as for me I do believe in an afterlife. What that looks like I’m not sure, is it reincarnation, it is like the book 5 people you Meet in Heaven, is it like that movie with Robin Williams “What Dreams May Come”…I don’t know. I do feel we have a purpose and a role to play in this life, and I do think there is a higher power. It really is a spiritual journey for oneself to ask these questions and I think that philosophical nature in You Tiff, is maybe you are ready to read some books that will guide you spiritually, as Oprah did. Oh how I wonder. I wonder why I was one of the lucky ones to have an almost ideal childhood, how I got lucky to skip most of the teenage angst that my peers suffered, how I managed to find a good man, have amazing children, live an almost charmed life. Is there reincarnation? Did I do something amazing in a pervious life to deserve all this good? I do believe in an afterlife. I do believe that there is more than just this. I can’t explain why, I just do. Maybe BECAUSE I often feel small, I have to believe there is something so much bigger than me out there, watching this all unfold. 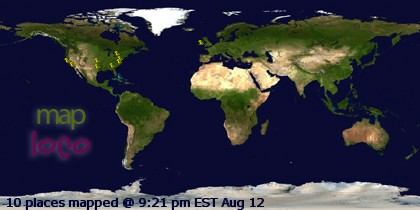 With 6.91 billion people inhabiting the Earth right now…we are a BLIP…. I would keep the “wondering” to the Home front…..That will keep you large in their eyes..
Oh my… don’t even get me started. These are the very mind worms that keep me tossing and turning at night. I so understand!!! Somedays, life, world, EVERYTHING feels just so much bigger than me. I sometimes get scared about what happens after this life and then lots of times I am scared by this life. I also spend much too much time being overwhelmed by the thought of eternity. Some days the thought of never dying is scarier than the thought of dying — I know, I’m weird. But short story long… I hear you! I wonder too. Especially when there are tragedies like the recent earthquake in Japan. But my faith has answered every question I have ever had. I love this life, the time I was born in to this world, for the present time, for my childhood, and for what the future may hold. I LOVE LIFE!! But I know that the life after this will only be that much more amazing! The best thing about my religion is that we believe families can be together forever, that marriage doesn’t end “at death do us part” and that couldn’t be more meaningful to me. If you ever want to hear more about what I believe, I would love love love to share them with you. My favorite thing about this post is the thing you said about your husband. I can tell that you two have a great marriage, and how hard you work to make it a great one. These thoughts have been on mind at one time or another. It keeps me up at night. No words of wisdome, just know that you are not alone. Great post and YES!! All.the.time! Like others have noted it is my faith that keeps me grounded. Whether you and others believe in the Bible or not, I would encourage you to find and read Psalm 139. It is amazing and one of my favorites! That is an awesome passage, Cara!! Thanks for sharing. We thjink so much alike. I did a post kinda like this about a year ago. I was reading “The pillars of the Earth” and it made me think about how little time we have here and how we really mean nothing in the scheme of things. Eye opening isn’t it?